The sounds bamboo chopsticks emit when they’re snapped in half are remarkably similar to the laws that govern the magnitude and frequency of earthquakes. Such insights could one day help engineers determine more precisely when a bridge or dam, for instance, might be about to fail. There’s a thriving community of researchers who study how things fracture. There are seismologists, to be sure, but also physicists and materials scientists, who study how various materials fail in hopes of manufacturing more robust airplane wings, or stronger glass for car windshields. Typically, a crack begins to form inside the material in response to an outside force, like a rock hitting a windshield. The crack will then spread faster and faster, branching out in a pattern reminiscence of herringbone or a lightning bolt, until the material’s structure fails completely. The sounds produced as cracks propagate through materials are useful for acoustic monitoring. That technology is routinely used to detect possible cracks in structures like bridges, dams, or buildings that may not be immediately perceptible via traditional monitoring methods. The better scientists understand those sounds, the better our acoustic monitoring systems will be. In the past, scientists have studied things like the acoustic properties of concrete, charcoal, paper, rock, and wood plates, and found striking similarities to the acoustic emissions of earthquakes. But those objects tend to fracture in multiple places—even dry spaghetti, which was the subject of a 2005 study examining why a bunch of spaghetti almost never snaps into two pieces. This makes it challenging to interpret experimental data. That’s where the chopsticks come in—specifically the bamboo variety so common to Taiwan and China. 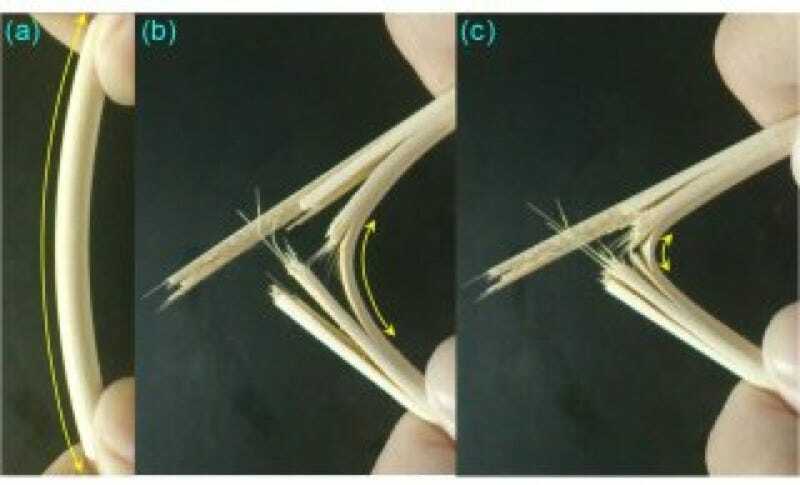 In a new paper in Physical Review Letters, physicists from National Taiwan University describe how they chose to study the sound of bamboo chopsticks snapping because bamboo rarely fractures in multiple spots at the same time. The results: the crackling noises produced by a breaking bamboo chopstick (and a bundle of dry spaghetti) indicated that there was one main shock wave, followed by several aftershocks as the cracks propagated through the bamboo — in keeping with the three common laws governing earthquakes and aftershocks. They also found parallels with Omori’s law and Bath’s law, which describe the behavior of aftershocks: namely, the rate of aftershocks decreases quickly with time, and the difference in magnitude between a main shock and its largest aftershock is roughly constant. In short, “The statistics of these acoustic events is shown to correlate with that of tremor,” the authors concluded in their paper. Images: Tsai, S-.T. et al./National Taiwan University.